Follow RETHINKING Behavior and MSLBD! Your comments about the magazine are welcomed! Let us know what you liked, and how we can improve! Add your email address here for a free subscription (three issues during the school year), and to receive other MSLBD announcements! MSLBD will not share your email with anyone. Lend support, affirmation and a sense of collegiality among those who work with students with emotional, behavioral and/or mental health needs; Provide thoughtful discussion, analysis and commentary on issues; Provide current information about practice, policy and research; Present personal stories and perspectives of children and youth, their families, service providers, educators, and others; and Offer humor, parody, fiction and some fun! 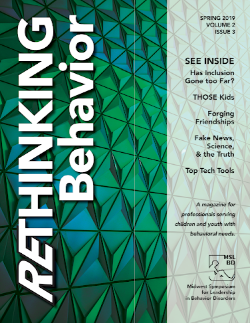 Are you interested in contributing to ReThinking Behavior? What are the goals, audience, content & structure? How is a magazine different from a professional journal? Do you have an idea for an article? Do you want to submit an article you have drafted? What is the style guide for contributors and editors? Download a pdf of all of these materials for potential authors.